Our company excels in providing Frameless Glass Partitioning to the clients. 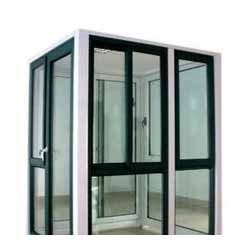 Frameless Glass Partition is manufactured under the supervision of adroit professionals using the finest quality raw material. Offered range is available in variable specifications and dimensions in order to meet different choice of clients. Came into existence in the year 2008, Concept metal solutions is engaged in offering to its customers a rich assortment of products for interiors and kitchens. Our company is having its corporate offices based at Coimbatore, Tamil Nadu (India) and is executing engaged in operating its all business activities as a Sole Proprietorship based venture. We have been instrumental in offering a rich assortment of products such as Aluminium Modular Kitchen, Aluminium Door, Aluminum Window, Demountable Office Partition and many more to our customers. We are also known to provide Coating Service, Installation Service and Maintenance Service to our customers. Our company is indulged to the most modern style of living. Upgrade yourself to a whole new lifestyle experience. We invite our clients to explore our world and let them look forward how we together can raise a concept to their classic lifestyle. We ensure our customers of timely transits to their destination. We export 30% of our product to Oman, Kuwait, UAE and Some African Countries.